It’s estimated the average American spends nearly 3 hours a day watching TV. Many bemoan the fact that people waste so much time with mindless entertainment like this but I don’t really have a problem with it as long as you take care of business elsewhere in your life. We all need some time to decompress and shut off our brains for a while. I basically read, write, listen and talk for a living. It’s nice to take a break and allow mindless entertainment to take control every once and a while. Plus the ability to watch TV is made possible by the many innovations in the home most of us take for granted. Households used to average almost 12 hours a week on laundry up until the 1920s. Now that we have washers and dryers it only takes up 1.5 hours on average.1 Dishwashers, microwaves, and takeout food have all done their part to provide more downtime as well. When you combine the costs with the fact that streaming services and smart TVs now make it easier than ever to consume content, cutting the cord is quickly becoming the go-to strategy for many who are trying to minimize cost or services. I still can’t believe I did this but after the tweet at the top of this post went viral and a couple of friends told me their strategy for cutting the cord I decided to look into it myself and give it a test drive. Right now we pay around $160 a month for cable, internet, and a landline we will never use in our lifetime that’s basically set up to get a triple play discount and accept robocalls. Our cable line-up probably includes 300+ channels and every movie channel imaginable. It’s certainly overkill but I would be lying if I didn’t take some comfort in having all those options (plus of course we have Netflix and Amazon Prime to choose from). The two legitimate options for cutting the cord were YouTube TV and Hulu Live. Both offer somewhere in the neighborhood of 60 channels including local stations, some of the more well-known cable options, and a decent slug of sports. Both cost around 40 bucks a month. These are streaming platforms so you can’t completely cut the cable providers out of your life because you still need internet. I priced mine out at current speeds and it comes out to $60/month for Internet alone. You’ll notice an extra $15 charge on Hulu Live for DVR. This is the one I tried out even though it costs a little more because Hulu Live also gives you a subscription to the regular Hulu service and I like a few of the shows on that one. 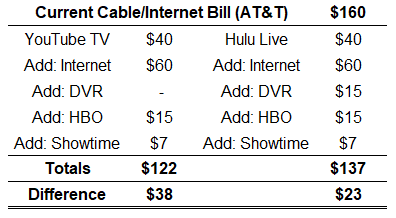 So there is a real cost saving here from cutting the cord ($720/year for YouTube TV and $540/year for Hulu Live). Now the difference doesn’t look so stark. Obviously, I probably don’t need all those movie channels. Cinemax and Starz are definitely expendable. But HBO and Showtime both have a ton of shows I watch. Those two are non-negotiable. 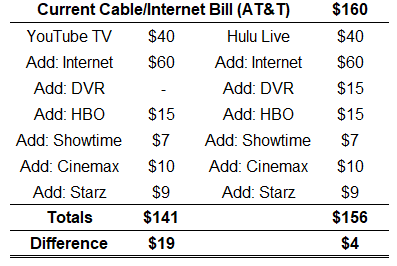 There are some savings here but I would bet my right arm that the cable companies won’t stand for huge losses. They’ll simply raise internet prices for people who give up on their other services eventually. The cost savings for a similar experience aren’t quite there yet and I don’t know that they will be until Google or Facebook start offering free internet to the world in exchange for our souls. Maybe you live in a big city that has more affordable internet options but it seems that is the bottleneck at this point. I tried Hulu Live for a week. It’s a slick service even though it takes some getting used to. But the cost savings are only really there for people who truly want to cut cable down to the bare minimum. That is not me. Not now at least. I don’t mind paying a little extra for entertainment options. For my household, cutting the cord isn’t ready for primetime just yet. 2This is why once a year I’m forced to “cancel” my cable subscription to negotiate the best deal.